LOW EXPECTATIONS, according to Psychologist Barry Schwartz in this TED talk, where he mostly talked about the problems of having too many choices. One of my research interests is to help people make better decisions, but in this TED talk Ruth Chang says there is not necessarily a better decision/alternative. Apart from being better, worse or equal, an alternative could also be "on a par" with another. The choices are hard because the alternatives on a par are in the same neighborhood of value, in the same league of value, while at the same time being very different in kind of value. Hard choices are a godsend, because a world full of easy choices only would enslave us to reasons, according to Ruth. In making hard decisions, she suggests us to put our very selves behind an option and create reasons, instead of drifting and allowing the world to write the story of our lives. 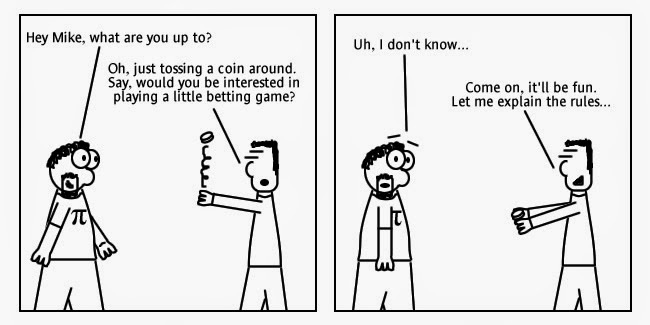 If you have to toss a coin--create your own rule! At least for now another successful case where the Public are invited to join the force to control invasive species, reported Nature. Another successful example I saw recently was how community participation and adaptive management turned back the tide of American mink invasion in Scotland. Of course such a strategy does not always work, and the same article mentioned a couple of examples: pythons in Florida and red foxes in Australia. The pythons proved tough to catch because they were hard to spot in the Florida brush, and the removal of 1/5 of Victoria red foxes ended up boosting the population because the survivors thrived when they had less competition. Here is a recent paper reviewing such public-involved harvest programs. A UK effort jointly developed by six institutions. 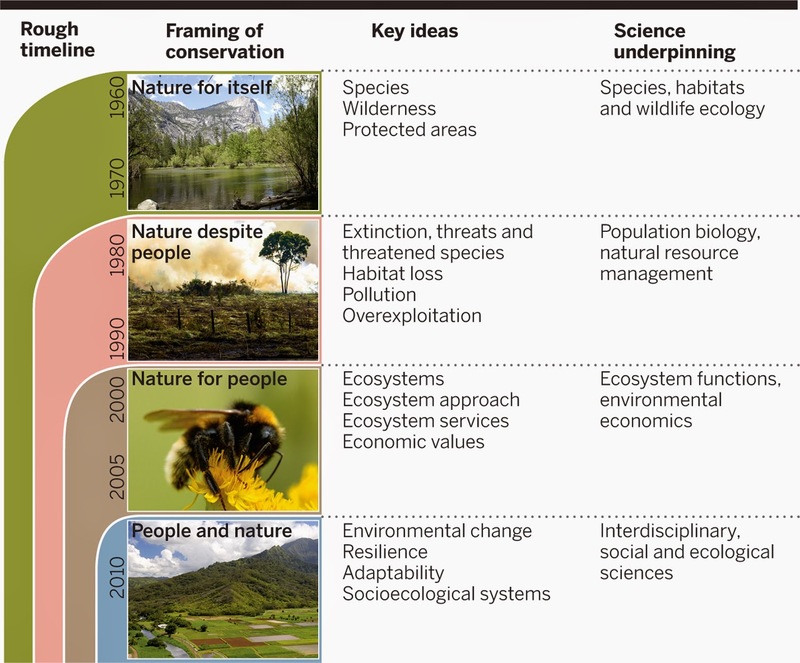 TESSA fits the gap for 'rapid appraisal' of ecosystem services that do not require substantial resources or specialist technical knowledge. It is designed for local non-specialists. The figure above from this paper shows TESSA's methodological framework. A PNAS paper by UVM/GIEE colleague Thomas Dietz, where he proposed to use public participation as a mode of science communication. 1. Good decision-making should be factually competent, value-competent and adaptive. 2. Adaptive risk management, sometimes called adaptive risk governance, is a response to the challenges of uncertainty we face. The core idea is that decision should take explicit account of uncertainty, facilitate social learning, maintain some flexibility, and revisit the decision periodically. The idea is appealing, but implementing it will require careful thought about how to engage both uncertain facts and uncertain values, and how to learn as we move forward. 3. It is useful to distinguished three types of expertise we need or making decisions under uncertainty: scientific, community and political. Community expertise is what most members of he public develop in their day-to-day lives. It is also the expertise on what the public cares about: expertise about values. Political expertise is not only in values, but in what might work and what might not, given the stance of other political actors and the capacities of local organizations and institutions. We have to meld these forms of expertise into an alloy that is better at informing decisions than any one form of expertise would be acting alone. 4. "Policy analysis tools, such as beneﬁt–cost analysis, assume agreement both on the values we assign to decision outcomes and on the appropriate process for reconciling value differences to reach a decision. However, people may differ not only in what they value but in how they believe value differences should be resolved." 5. When we acknowledge value differences, we are also accepting that our differences are going to be more difﬁcult to reconcile than if they were based solely on different beliefs about the facts. 6. Policy relevant but not policy prescriptive! science cannot tell us what we should care about: Science has no privilege with regard to values. 7. Get the science right + Get the right science. Dialogue with those who carry political and community expertise can help scientists understand the constraints on decision making, the local context to which scientiﬁc analysis must be applied, and the issues of concern to those who will inﬂuence a decision and those who will be affected by it.